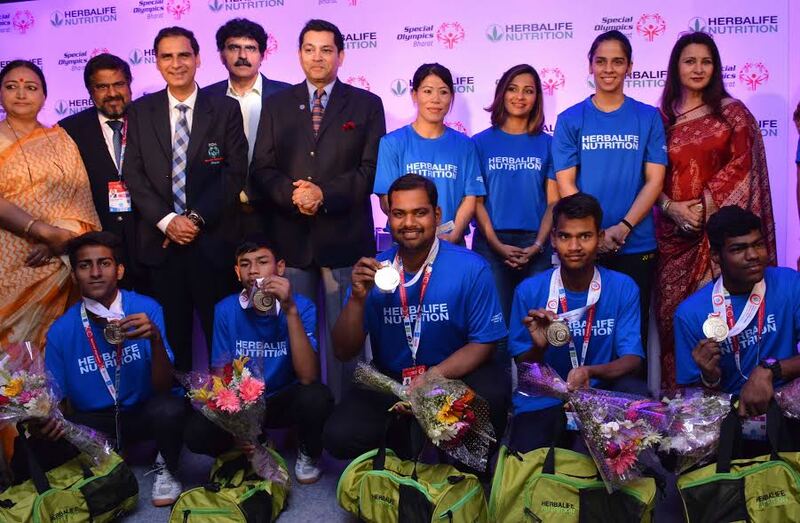 New Delhi: To celebrate the outstanding achievements of India’s Special Olympics athletes, Herbalife, a global nutrition company, held a rousing homecoming reception for 89Special Olympics athletes. Returning home with a haul of37gold medals; 10silver medals and 26 bronze medals, participating athletes were recognised for their excellent display of strength, grit and courage in 8 events at the Special Olympics World Winter Games 2017 held in Austria. MC Mary Kom, five-time World Amateur Boxing Champion and Olympic boxer,Heena Sidhu, India’s first Air Pistol Shooter – were also present at the event and SainaNehwal, India’s star badminton player – all Herbalife sponsored athletes were also present on the occasion. “Special Olympics has been gaining visibility and momentum over the years. What these athletes need more of right now is the encouragement, support and recognition by the public. With a partner like Herbalife, I can see things getting better, and I wish them success in their future endeavours”, added Heena Sidhu. psychology and nutrition, to help athletes train and perform better in their respective fields. The session was helmed by renowned Sports Scientist and EQ Consultant, ShayamalVallabhjee.